I’ve written before about the pseudo-science of genetics, which is almost as crazy as the popular understanding of it. Our culture has long proposed that Oliver Twist could grow up middle-class in the slums because of his inherited traits. But in the age when the scientific gurus in popular films are geneticists, things have gotten nuttier. A book and movie called The Time Traveler’s Wife presents a handy depiction of roughly the way that many people think of genes. A character has a “genetic defect” that causes him to constantly travel backwards or forwards some years or months. When he knows future events, such as a winning lottery number, he’s able to win the lottery. But when the events are . . . well, anything other than the lottery, he is utterly incapable of altering them. If he knows his mother is going to die in a car crash, he can’t tell her not to get in the car. When he knows he’s going to be shot, he can’t duck. Now, this doesn’t make any more sense than do any of the usual problems with time-travel fiction (such as: what was altered by somebody else not winning the lottery?). That is, we’re not given any explanation as to why he can’t duck or take his mother on a long hike, or what would happen if he tried. We’re simply informed that nothing can ever be changed. Everything is pre-determined despite knowing it, and it is pre-determined principally by genes — which are only overridden by the magic of the lottery. Genes are an unlikely source of such power. Some 90% of your genes are the same as the genes in a mouse. Over 99.9 percent of your genes are the same as my genes. 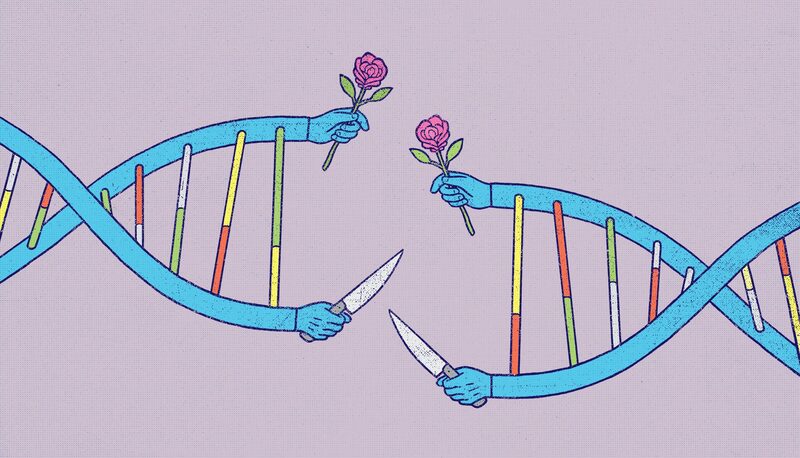 So, there’s very little for us or our genes to compete over in terms of reproduction, and it makes as much sense to claim that kindness to mice is dictated by selfish-gene pseudo-Darwinism as it does to claim that human sexual habits are. In addition, your body contains some 10 million times as many genes that are not human at all as those that are; these are the genes of tiny organisms that live in your gut and elsewhere — and impact your personality; so do epigenetic changes to your genes during prior generations and your own. So does your mother’s diet, and your experiences before and just after birth, and during early childhood, including your diet and pollutants in your environment. While dramatically unusual abuse of a child can have impacts on the later adult’s morality, the case made in Darcia Narvaez’s book Neurobiology and the Development of Human Morality: Evolution, Culture, and Wisdom, is that ordinary child rearing in modern Western culture creates adults with moral failings that typical child rearing in small bands of hunter-gatherers tends not to. We even expect children to be distressed , babies to cry a lot, toddlers to behave as “terrible twos,” and adolescents to go through turmoil. We declare such things “normal,” even though, argues Narvaez, they are not normal in the small-band hunter-gatherer cultures that predominated for most of the existence thus far of the human species. Narvaez credits many factors other than genes with the character of the people in certain cultures observed by Westerners to be almost incomprehensibly peaceful: the Ifaluk of Micronesia who were shocked, terrified, and made ill by a Hollywood depiction of murder of the sort that U.S. children have mostly seen countless times; the Semai of Malaysia who explain their lack of violence against attackers by stating that the attackers might have gotten hurt. What sort of early childhood contributes to a peaceful culture? To give just a few highlights: a soothing prenatal experience, meeting of needs promptly, constant physical presence and touch, breastfeeding through age 4, multiple adult caregivers, positive social support, and free play in nature with multi-aged playmates. Narvaez argues that adults can change, and would probably agree that most of us should. That is, we can change ourselves, not just our child-rearing practices. But the society we’ve created now, through a centuries-long vicious cycle of normalizing fear and suffering, has resulted in a population of people who in too many cases have an excessive longing for the familiar and safe, a sense of superiority, too much anger, too much fear, too much desire for control. These traits are not “human nature” by any definition of that nonsensical term, but they are exactly what people selling a war on Venezuela as philanthropy love to see in their audience. “Human nature” is an old standby excuse for anything shameful. I didn’t forgive or forget or assist or understand or duck a bullet or save my mother from a car crash because of “human nature.” I think it’s a damaging concept even if one tries to define it as “in line with the most common or most admirable practices of small band hunter gatherers.” For one thing, there’s a conflation of two different ideas in that definition. For another thing, it’s a definition not in need of a new, slightly mystical name. For yet another thing, there’s no evidence that humans have ever tended to be or that we should want them to be all the same as each other. And, in addition, we need a particular morality now and it is a new one (see below). Now, there’s an obvious objection to the idea that war is in our popular culture rather than our genes, namely that wars are often very unpopular. Perhaps war is in our lack of democracy. The people of Okinawa just voted down another U.S. military base yet again. But nobody actually cares. The base is being built anyway. I believe both explanations of war are true. Given the democracy deficiency, we need a culture far more opposed to war than this one is. There’s also an objection created by recent events to the idea I find in Narvaez’s book that a good, kind, secure, sociable person is a moral person. To be moral right now is to be engaged in radical nonviolent activism against climate destruction and war. To be anything else, no matter how nicely you are anything else, is to be immoral. Our immoral behavior has created this need for a new morality. It is one that most past generations of humanity never faced. Their wisdom and example are needed, but are not enough. My moral mindset may shift from one situation to another, as Narvaez suggests, but I don’t find myself suddenly supporting fossil fuel subsidies or nuclear weapons. We actually have an existential need of a more intellectual (as well as more humble) morality. And we need it adapted to global thinking if we’re going to have a habitable planet.